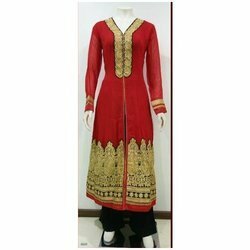 Pioneers in the industry, we offer churidar suits, embroidered ladies suit, designer indian salwar suits, ethnic suits, skirt suits and ladies cotton churidar from India. In order to meet the individual requirement of the clients, we offer attractively designed array of Embroidered Ladies Suit. Our entire product range has smooth texture and is delivered in standard patterns. Our entire product range is classy in nature and ensures designer looks. We offer them for all group clients. 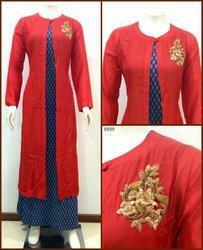 Our collection boasts of creations of best Indian designers and also regular Indian women’s clothing. Get gorgeous ethnic clothes and dress up just the way Indian women dress. We are offering Ethnic Suits to our valuable customers while keeping in mind their demand. We offer product to meet the satisfaction of customers by our best product. We try to keep the cost of the product minimal. The product is made by our expert team with their long experience. The finishing of the product is making it appreciable among the customers. We are the leading distributors and suppliers of Suits. 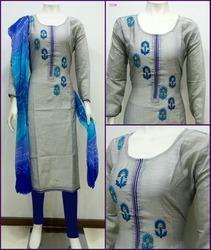 Banking on the individual requirement of the clients, we offer wide array of Ladies Cotton Churidar. We offer them with varied clubbing and are delivered in standard patterns. Our entire product range is extremely stylish in nature and is delivered in standard lengths and sizes. They can be easily carried with long kurtas and comes within the budgetary limits. Owing to years of experience in the industry, we offer world-class array of Cotton Salwar that are skin-friendly and are offered with eye-catching looks. Offered product range is shrink-resistant and are delivered in standard sizes. We offer them in varied enchanting patterns and can be worn with perfection. Cotton Salwar is offered in varied vibrant color combinations.